Grenadier Island is one of the components of St Lawrence Islands National Park. This National Park was the first east of the Rocky Mountains, founded in the early 1900’s. It is made up of 19 islands (or portions of Islands) in the Thousand Island group, stretching from outside of Kingston almost up to Brockville. There is a fee to use the Islands, which is collected through self-payment kiosks at the docks on each Island. Although we haven’t visited many of the Islands, we often anchor off their shores. Yesterday, we cruised up to Grenadier Island, which is the farthest east we have been since we arrived in Kingston, about 15 nautical miles east of Gananoque. Grenadier is a fairly large Island, and is a mixture of private land and National Park. There are four distinct areas of National Park on the Island. We anchored off the central park, and dingied up to the dock. After paying our admission fee (a whole $3.20 for day use for an 8 foot boat), we wandered up the trail to the other side of the Island. There are quite a few campsites on this Island, but they were all empty. After grabbing a geocache, we strolled along the Old Township Road. Until the 1960’s, Grenadier was a farming community. A number of farming families maintained fairly substantial farms, despite the difficulties in getting produce and goods on and off the Island, particularly in winter. Today, the private area of the Island is mainly made up of summer cottages. Even today, getting supplies to the Islands, particularly construction supplies, can be challenging since there are no bridges or roads. Boats are the principal means of transportation, and barges are hired to bring more substantial items to the Islands. 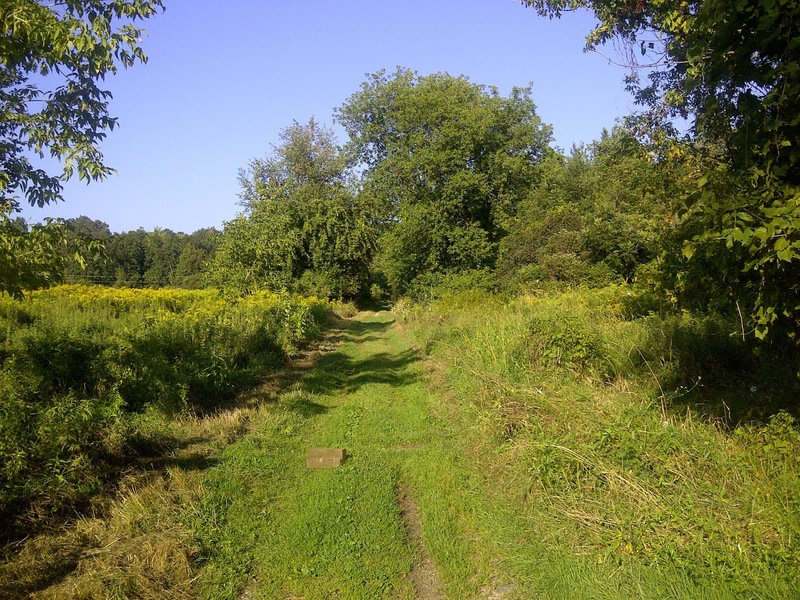 The remnants of the old township road still exist on the Island, running from one end to the other. However, today this is little more than a maintained cart track, which the residents seem to use for off-road vehicles. 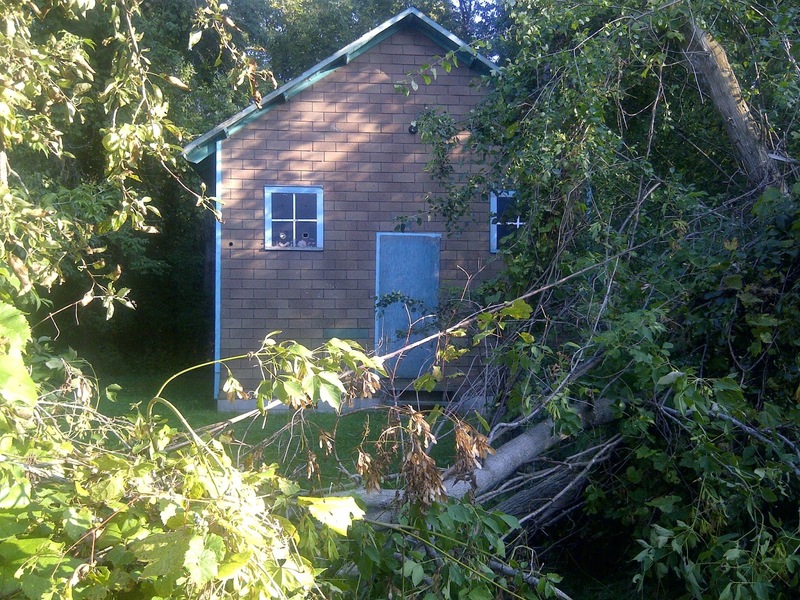 Just outside of the park boundary and along the Old Township Road, the Island schoolhouse is still standing. This school was abandoned in 1963, when the population had withered down to three students. We have been fortunate to have lots of friends and family visit us this summer. Whether for an evening aboard, a day trip with lunch and swimming, or a few days out, we love sharing something we love doing with our friends and family. A few weeks ago our friends Michelle and Sean and their two girls, Kaitlyn and Emma, came from PEI for a 5 day visit. My Obsession theoretically sleeps 6. However, the v-berth has been retrofitted as an office. This means that really we have the two single berths in the main cabin and our bed in the stern cabin. Jay and I are perfectly comfortable aboard, but unlike our house in PEI which can sleep 10, we do not have a lot of room for overnight visitors. I warned our friends that they were welcome to stay aboard, but quarters would be tight. Now, our friends Alison and Steve and their two little boys have a power boat, a cruiser, at Collins Bay that has more beds and they offered overnight accommodations too. Michelle and Sean and the girls arrived late in the evening, around 9:30pm. We made beds up for the girls on the settees and stayed up in the cockpit, chatting until late. Rather than disturb Alison and Steve on their boat due to the late hour, Michelle and Sean decided they would sleep in the cockpit that first night. Especially with the full enclosure, this would be similar to sleeping in a tent. Everyone managed to get some sleep and the next day, both boats headed out to Kerr Bay. We anchored in the Bay and spent the next two days back and forth between the two boats. Watching the four kids fish, swimming, motoring around in the dinghy, reading, playing board games, water fights with pool noodles and noodle blasters, BBQing, kayaking, floating on pool noodle chairs, laughing and chatting - the two days were a blur of sun, fun, good food and great friends. We even had a surprise party at anchor to celebrate Michelle finishing her degree. A couple of nights the kids slept on the power boat with Alison and Steve and the boys, leaving just the four of us on My Obsession. The last night the girls slept in the cockpit – their chance to try that out. All week, the boat was bursting at the seams with people and stuff. We were having a blast. Michelle and Sean and the girls left on the Friday. Alison and Steve and the boys headed back to their farm. By Friday evening, My Obsession was back in order, all neat and tidy with everything in its place - and feeling very big, very empty and definitely lonely. In the Thousand Islands group known as the Navy Islands, there is nice large anchorage to northeast of Stave Island and east of Hickey Island. If you approach from the west you can enter it several ways. We often enter by coming through Gananoque Narrows and then round the southeast of Stave Island and enter through a small channel. There are several rocks to pick your way around, but they are marked. The channel shallows to about 9 feet, but once inside you can anchor in about 15 to 20 feet. We anchored here several times last year and on the long weekend of July we thought we would try it again. When we arrived we were the only sailboat out of the 6 boats in the anchorage. We put Ducky in the water and decided to explore. The cruising guide recommends dinghying through the narrow channel between Hickey and Stave Islands, through what is known as Molly’s Gut. According to the guide it is a major fish spawning and nursery area and you can see lots of fish, and so they recommend no motors in the passage. We motored across the anchorage and then turned off the engine as we entered the narrow passage. Our dinghy is only 8 feet long, so when you are rowing it is a bit hard for the other adult to stay out of the way. Nonetheless with some jockeying, Jay was rowing and I was hanging over the side, the camera close by, looking for fish. The water is very clear in Molly’s Gut and the two islands rise up on either side, with lush trees overhanging the passage. How beautiful it was. The afternoon sun was slightly shaded in the narrow passage, and a silence seemed to fall over us as we made our way up the Gut, drifting more than rowing. I was enjoying the peace and beauty around us. However, despite our clear view of the weedy bottom, we discovered the fish were rarer than hen’s teeth. We saw nothing moving beneath us. Jay was ready to turn on the engine, pointing out we could hardly disturb something that wasn’t there. I resisted, still hopeful that we would see something. There is a small marsh area on the west side of Hickey and Jay gamely rowed on, our little rubber dinghy plodding along, sweat starting to bead on Jay’s forehead as the sun emerged from behind the islands. Every time Jay mentioned he wanted to turn on the engine, I asked him to wait just a little longer as I continued my vigil for the elusive fish. We were almost across the marsh when a pontoon boat, both its outboards chugging along, entered from the far side of Curtis Island. They waved merrily to us as they sped by and entered Molly’s Gut without killing their engines. The occupants of the pontoon boat had apparently not read the cruising guide about no motors in the Gut. Either that or because no one had been reading the guide, the fish had packed up and moved elsewhere and we were the only ones who did not realize there was nothing left to protect. As the sound from their engines faded in the distance, Jay looked at me as if to say, see now we can turn on the engine. He reached for the pull cord on the engine. Before Jay could pull the cord, we noticed a flash of white in the tall grass along the shore of Curtis Island. Now it was Jay who let his hand fall from the engine pull cord as we watched the swans usher their small ones deeper in the weeds. I reached for the camera, as Jay tried to row us closer, but we were not able to get a really clear view without getting too close. After a few minutes of watching the graceful swans, Jay rowed us out the other side of Curtis Island and we motored back to the anchorage. Even though there were no fish, leaving the engine off had still afforded us a glimpse of the peace and graceful beauty of the swan family. April 27th was move aboard date this year. Collins Bay Marina was pretty empty for the first month. Very few boats were in the water on B dock until June. Although we didn’t take our first weekend sailing until May 18th as Jay was away at the beginning of May, we head out sailing almost every weekend in the summer and anchor for the weekend. In May popular anchorages are almost empty. These same anchorages in July and August are packed. Here are some of our weekend anchorages from our early summer weekends and a few notes about them. In late May we anchored off Beaurivage Island, one of the islands in the St. Lawrence Islands National Park. This anchorage is at the west end of Wanderers Channel, which winds its way through the Admiralty Islands group. Tour boats from Gananoque use Wanderers Channel as it is very pretty, making the anchorage a bit bouncy by times as they pass, but it is a nice anchorage. If the wind picks up from the southwest, you need to be wary as the shelter is mediocre. You can enter this anchorage north of Bostwick Island or south of Beaurivage Island, but you must pay attention to the charts and pick your way in among the rocks. One of our favourite things to do in here is dinghy around Bostwick Island to Half Moon Bay and the small open air chapel. It is very pretty and very peaceful. We followed this trip with a weekend at Prinyers Cove, on Prince Edward County, about 17 NM west of Collins Bay. This is a very protected cove with good holding. However, it is getting difficult to anchor as there are so many mooring balls in the cove. If you arrive early in the day or are there early in the season it is less crowded. We have since heard that the authorities are asking cottagers to remove mooring balls as it is getting out of hand. In June we also popped across to Kerr Bay on Amherst Island. This large bay is sheltered from prevailing southwest winds and is a short 6 NM from Collins Bay. Although the bottom can be weedy, it is good for swimming and can hold lots of boats. We anchored in there with the tall ship, St Lawrence II, several times this summer.